Some ten years ago I was lucky enough to be sent the first two albums by Zip Tang, 'Luminiferous Ether' and 'Pank', and I was incredibly impressed not only by the gorgeous digipaks from an independent band, but the quality of the music which was quite unlike anything else coming out of the scene at that time. I was told that they were recording a third album, and that I would be sent it to review, but then heard nothing and attempts to contact the band went nowhere. Fast forward to 2018, and one day I received an email from guitarist/singer Perry Merritt. It transpired that the person who used to undertake their publicity had long parted from the band, and they were trying to get back in touch with those who had been involved previously, and would I be interested in hearing their last three releases? Would I? 'Feed Our Heads' was released in 2010, with the same line-up from the previous albums, namely Perry, Fred Falller (drums), Marcus Padgett (keyboards, woodwind and vocals) and Rick Wolfe (bass, mandolin and vocals). The band move between multiple styles, so one is never sure what is going to come next. Their jagged attack is reminiscent of early Mr So & So combined with Poisoned Electrick Head, while there is also plenty of Zappa, Soft Machine, Gentle Giant and kitchen sink. Yes, definitely lots of kitchen sink. One minute they can be frenetic with music so sharp that they are all at risk at cutting themselves on the notes, and then they move into a mandolin folky number with flute and acoustic guitar, and drums that have a major impact by not being involved at all! I really enjoyed their first two albums, and this continues in the same vein, showing that here is a band that is truly progressing through the music by refusing to sit in any particular area for too long, and within individual numbers there is so much going on that the only way to enjoy it is by paying close attention. But, for all the cleverness and intricacy, this is still an incredibly enjoyable and accessible album which is a delight from start to end. 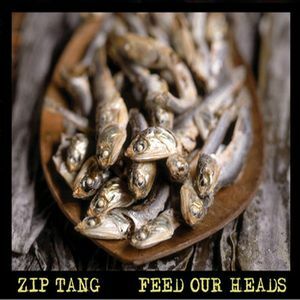 Post a review of ZIP TANG "Feed Our Heads"